Draft: 2013, Chicago White Sox, 1st rd. Married Bria … has one daughter: Peyton ... Twitter: @TimAnderson7 … Instagram: @timanderson7 ... Attended East Central Community College in Decatur, Miss., where he led the nation with a .495 average and ranked second with 41 stolen bases as a sophomore in 2013 ... Signed a letter of intent to play baseball at the University of Alabama-Birmingham prior to being drafted by the White Sox ... Graduated in 2011 from Hillcrest High School in Tuscaloosa, Ala. … did not play baseball until his junior year … led the basketball team to the state title as a senior. American League Leaders: 7th-SB (26) ... Became the first shortstop in White Sox history to record 20-plus home runs and 20-plus stolen bases in a season ... Joined Boston's Mookie Betts, Cleveland's Francisco Lindor and José Ramírez, Pittsburgh's Starling Marte and Colorado's Trevor Story as the only players in the majors with 20-plus home runs and 25-plus steals ... Fell four steals shy of joining Alex Ríos (2010) and Tommie Agee (1966) as the only Sox with a 20-HR/30-SB season ... Recorded career highs in doubles (28), homers (20), RBI (64), walks (30), runs scored (77) and extra-base hits (51) ... His 20 home runs were the most by a White Sox shortstop since Juan Uribe in 2007 (20) ... Committed 10 errors over his first 52 games, compared to 10 over his final 101 … did not commit an error in 24 consecutive games from 8/11-9/5 … lowered his error total from 2017 (28) ... Offensive Opener: Recorded his first career multi-homer game and matched his career high with three RBI (fifth time) on Opening Day (3/29) at Kansas City … joined teammate Matt Davidson (three; 2018), Alejandro De Aza (2014), Jim Thome (2008), Sammy Sosa (1991) and Minnie Miñoso (1960) as the only Sox players to hit two-plus home runs on Opening Day ... Stole four bases over the club's first six games, the first Sox player to accomplish the feat since Hall-of-Famer Tim Raines in 1992 (also four) … his six stolen bases were the most by a White Sox through the team's first 10 games of a season since John Cangelosi in 1986 (seven steals) ... Hit a game-tying, RBI single in the ninth inning on 4/18 at Oakland … connected on his fifth career leadoff homer on 4/28-2 at Kansas City, tying Pat Kelly for the fifth-most in Sox history ... Andersons Give Back: Along with wife, Bria, and in conjunction with their League of Leaders organization, awarded the first Branden Deon Moss (BDM) scholarships on 5/1 … Reagan Ross and Lorenzo Winston, students at Hillcrest High School in Tuscaloosa, Ala., were the $500 scholarship recipients after submitting winning essays about their experience with violence and how violence negatively impacts our world … the scholarship is named in honor of Branden Moss, who was killed last year … Anderson and Moss were close friends, and both attended Hillcrest High School ... Recorded his second career multihomer game on 5/5 vs. Minnesota … homered four times in a four-game span from 5/25-28 … registered his third career multihomer game and a career-high four RBI on 5/26 at Detroit … hit a solo homer in the fifth and a three-run shot in the sixth ... Hit a game-winning, two-run triple in the sixth inning on 6/1 vs. Milwaukee and a game-winning, two-run single in the sixth on 6/6 at Minnesota ... Homered in consecutive games from 6/22-23 vs. Oakland, ending a 22-game drought … hit a three-run home run on his 25th birthday (6/23) ... Fell a home run shy of the cycle and stole two bases on 8/17 vs. Kansas City … became just the third player in franchise history to record a double, triple and two steals in a game (last Jim Rivera on 8/11/55 at Kansas City) ... Hit his 17th home run on 8/22 vs. Minnesota, matching his total from the 2017 season ... Hit his 18th home run on 9/2 vs. Boston, establishing a new career high … also recorded three extra-base hits in a game for the second time in his career (also 5/5 vs. Minnesota) … connected on a game-winning, two-run home run in the 12th on 9/12 at Kansas City ... Hit his 20th home run of the season on 9/22 vs. the Cubs, becoming the first shortstop in franchise history to record a 20-HR/20-SB season. Spent his first full season in the major leagues … his 17 home runs ranked sixth among American League shortstops and are the seventh-highest total in franchise history by a shortstop...Became the youngest shortstop (age 24) in White Sox history to record double digits in home runs...Ranked 12th in the AL with a .321 (51-159) average vs. left-handers … was successful on 93.8 percent (15-16) of his stolen-base attempts...Hit three of the franchise-record eight leadoff home runs, increasing his career total to four...Hit .204 (19-93) in April but rebounded to bat .319 (30-94) in May … combined to hit .206 (36-175) in June/July...Batted .343 (36-105) over his last 25 games and .299 (66-221) with 13 doubles, eight home runs and 27 RBI over his last 53 (8/2-end of season)...Committed a major-league high 28 errors but just six over his final 65 games of the season...Agreed to terms on a six-year, $25-million contract on 3/21 … the deal includes club options for 2023 and 2024, with $1-million buyouts on both option years...Was the White Sox Opening Day shortstop on 4/4 vs. Detroit … connected on his second career leadoff home run on 4/13 at Cleveland (off RHP Josh Tomlin)...Hit safely in nine of 10 games from 4/17-28, going 13-42 (.310) with nine runs scored … matched his career high with three hits and three runs scored on 4/24 vs. Kansas City. Missed the three-game series from 5/12-14 vs. San Diego to return home to Tuscaloosa, Ala. for the funeral of a close friend, Brandon Moss … returned to the lineup on 5/16 at Los Angeles-AL and hit a go-ahead, solo homer in the 11th inning...Hit a game-tying, solo home run in the eighth inning on 5/18 at Seattle as part of back-to-back homers with Todd Frazier … connected on his sixth home run on 5/30 vs. Boston, a solo shot off former teammate Chris Sale...Was ejected by home-plate umpire Jim Wolf (first career)for arguing balls and strikes on 6/23 vs. Minnesota (24th birthday)… snapped a 22-game homerless stretch with a three-run shot in the ninth inning on 6/26 vs. the Yankees... Homered for the second straight game on 7/8 at Colorado, a game-winning, solo shot in the ninth inning off Greg Holland, his first career game-winning homer in the ninth or later...Hit safely in 14 of 15 games from 8/2-18, including two seven-game hitting streaks … batted .328 (21-64) with four doubles, two triples, five home runs, 12 RBI and a 1.036 OPS during the 15-game span, raising his average from .232 to .247...Also hit safely in 24 of 25 road games from 7/21-9/21 (.330, 35-106), bookended by 11- and 13-game streaks...Connected on his third career leadoff homer on 8/5 at Boston and his fourth on 8/15 at the Dodgers … hit four home runs in a six-game span from 8/9-15, including consecutive contests on 8/13 and 8/15...Recorded his first career game-ending hit on 8/23 vs. Minnesota, a ninth-inning single off Trevor Hildenberger...Matched his career high with three RBI on 9/3 vs. Tampa Bay, including a solo home run...Registered a career-high, 15-game hitting streak from 9/9-24 (.410, 25-61)… streak tied for the 10th-longest in the AL during the season...Went 3-5 with a triple and home run on 9/9 vs. San Francisco…fell a double shy of joining José Abreu as the only teammates in major-league history to hit for the cycle in the same game (STATS LLC)... Established a career high with four hits on 9/16 at Detroit … broke up Matthew Boyd's no-hit bid with a two-out double in the ninth inning on 9/17 at Detroit … joined Melky Cabrera as the second Sox player to break up a no-hitter in the ninth this season … the last team to break up two no-hit bids in the ninth was Atlanta in 1997. American League Rookie Leaders: T1st-3B (6); 2nd-R (57); T2nd-2B (22); T2nd-SB (10); 3rd-H (116); 3rd-TB (177); T3rd-XBH (37); 6th-G (99); 10th-HR (9); 10th-RBI (30). Appeared in 99 games in his rookie season with the White Sox … started 97 games at shortstop. Recorded 33 multihit games, tied with Jose Abreu (2014) for the seventh-most by a White Sox player in his first 99 career games … his six triples tied for fifth in the AL. Batted .326/.340/.457 with two homers and seven RBI vs. left-handers and .315/.333/.486 with five home runs and 20 RBI in 52 games at U.S. Cellular Field. Led off 41 times (.279/.303/.419/4 HR/12 RBI) and hit in the No. 2 spot 48 times (.278/.296/.409/3 HR/14 RBI). Compiled a .965 fielding percentage (14 E/400 TC) … committed one error in the first half (28 games) and 13 after the break (71). His contract was purchased from Class AAA Charlotte on 6/10 … was the starting shortstop that night vs. Detroit and recorded his first major-league hit in his first at-bat, a double to left field in the third inning … also scored his first run. Hit .333 (24-72) with five doubles, three home runs, nine RBI and 12 runs scored over 16 games from 6/23-7/10 after being moved into the No. 1 spot in the lineup on 6/13. Registered his first career multihit game (two doubles) on 6/14 vs. Detroit … recorded his first three-hit game, including his first triple and three runs scored, on 6/15 vs. Detroit. Hit his first career home run on 6/23 at Boston, a leadoff shot off Clay Buchholz that landed in the parking lot behind the Green Monster … became the first White Sox to lead off the first with his first career homer since Thad Bosley on 5/29/78 vs. Oakland (STATS LLC). Hit safely in seven consecutive games from 6/23-30, batting .394 (13-33) with two doubles, two home runs, four RBI, seven runs scored and five multihit efforts.  Homered in consecutive games for the first time in his career on 6/25-26 vs. Toronto … recorded his first multiRBI game on 6/29 vs. Minnesota. Recorded his fourth straight multihit effort and matched his season high with three hits on 6/30 vs. Minnesota … connected on a game-tying, two-run homer on 7/4 vs. the Yankees. Hit his fifth home run of the season on 7/18 at Seattle, a solo shot in the first inning … registered his third three-hit game on 7/30 at Minnesota. Hit safely in a season-high 11 straight games from 8/6-18, going 13-41 (.317) with four doubles, two home runs, five RBI, five walks, nine runs scored and a .944 OPS. Connected on a go-ahead, RBI single in the 11th inning on 8/10 at Kansas City … extended his hitting streak to 10 games with a two-run home run in the third inning on 8/17 at Cleveland … matched his season high with three hits on 8/25 vs. Seattle. Left the game on 9/1 at Minnesota after being hit by a Melky Cabrera line drive in the first inning. Snapped an 11-11 tie with a game-winning, two-run double in the top of the 12th on 9/4 at Minnesota. Hit safely in each of his last six games, going 11-26 (.423) with three doubles, two triples, two homers and five RBI. Hit his eighth home run, drove in a career-high three and fell a triple shy of the cycle on 9/27 vs. Tampa Bay … recorded three hits, including a home run, and drove in two runs on 9/30 vs. Minnesota (fell a double shy of the cycle). Appeared in 55 games with Charlotte … at the time of his promotion to the White Sox, led the International League in hits (75) and multihit games (25), ranked second in runs scored (39), fifth in total bases (101) and 10th in average (.304). Hit .346 (45-129) with five doubles, two triples, three home runs, 13 RBI, 24 runs scored and eight walks in May. Recorded four hits on 4/25 at Toledo and 5/12 at Norfolk … registered four straight multihit efforts from 5/10-13, 5/16-19 and 5/22-26 … homered in three consecutive games from 5/12-14.  Entered the season rated by Baseball America as the No. 1 Prospect, Best Hitter for Average and Best Athlete in the White Sox organization … also was tabbed by MLB.com as the No. 1 Prospect in the Sox system and No. 38 overall in baseball. Attended a rookie symposium in Washington D.C. in January hosted by Major League Baseball and the MLBPA. Led the Southern League in hits (160), runs scored (79) and stolen bases (49), ranked third in average (.312) and tied for third in triples (12) and total bases (220) at Class AA Birmingham ... Was selected to the SL mid and postseason All-Star teams … also was named Best Utility Man and Best Hustler ... Stole three bases in a game three times and recorded seven games with two stolen bases ... Hit for the cycle on 5/9 at Montgomery, going 4-6 with three RBI … went 5-6 with two doubles on 5/16 at Mobile ... Entered the season rated by Baseball America as the Sox No. 2 prospect … also tabbed by the publication as the Best Hitter for Average and Best Athlete in the organization. Combined to hit .301 (104-345) with 21 doubles, seven triples, nine home runs, 40 RBI, 57 runs and 10 steals in 83 games between Class A Winston-Salem, AZL Sox and Birmingham ... Began the season with Winston-Salem, where he was named a CL mid-season All-Star ... Was on the disabled list from 4/29-5/11 with right shoulder tendinitis and from 6/29-8/21 with a fractured right wrist ... Batted .320 (62-194) over his last 46 games with the Dash … was promoted to Birmingham on 8/22 … went 3-3 with a double in his Barons debut on 8/22 at Mississippi and 4-6 with a double and three RBI on 8/23 at Mississippi ... Entered the season rated by Baseball America as the No. 3 Prospect in the White Sox organization. Tied for fourth among Sox minor-leaguers with five triples and ranked sixth with 24 stolen bases during his professional debut with Class A Kannapolis ... Batted .360 (18-50) with two doubles, two triples and 13 runs scored during a 13-game hitting streak from 8/19-9/1 ... Was recommended/signed by Warren Hughes. April 20, 2019 Chicago White Sox activated SS Tim Anderson. 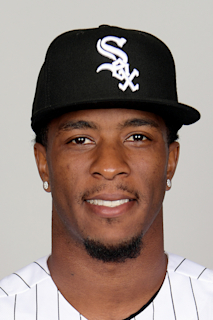 April 19, 2019 SS Tim Anderson roster status changed by Chicago White Sox. April 4, 2019 Chicago White Sox activated SS Tim Anderson from the paternity list. April 3, 2019 Chicago White Sox placed SS Tim Anderson on the paternity list. June 10, 2016 Chicago White Sox selected the contract of SS Tim Anderson from Charlotte Knights. April 6, 2016 SS Tim Anderson assigned to Charlotte Knights from Birmingham Barons. January 26, 2016 Chicago White Sox invited non-roster SS Tim Anderson to spring training. September 11, 2015 Birmingham Barons activated SS Tim Anderson from the 7-day disabled list. September 4, 2015 Birmingham Barons placed SS Tim Anderson on the 7-day disabled list. January 22, 2015 Chicago White Sox invited non-roster SS Tim Anderson to spring training. August 22, 2014 SS Tim Anderson assigned to Birmingham Barons from Winston-Salem Dash. August 15, 2014 Winston-Salem Dash sent SS Tim Anderson on a rehab assignment to AZL White Sox. August 15, 2014 sent SS Tim Anderson on a rehab assignment to AZL White Sox. June 29, 2014 Winston-Salem Dash placed SS Tim Anderson on the 7-day disabled list. May 11, 2014 Winston-Salem Dash activated SS Tim Anderson from the 7-day disabled list. May 1, 2014 Winston-Salem Dash placed SS Tim Anderson on the 7-day disabled list retroactive to April 29, 2014. April 1, 2014 SS Tim Anderson assigned to Winston-Salem Dash from Kannapolis Intimidators. June 13, 2013 Tim Anderson assigned to Bristol White Sox. June 12, 2013 Chicago White Sox signed SS Tim Anderson.